Klingenthal - the city with a lyra in its emblem - bears the sobriquet „city of music". The region‘s tradition of producing musical instruments is long and unique. One distinctive feature is the production of mouth organs in the area of Klingenthal and Zwota. The products always meet with the approvals of the clients from all over the world. Until today, mouth organs as well as accordions of the oldest factory, that still produces musical instruments, are played by musicians. Of course, these instruments come from the city submontane mount Aschberg. Many famous melodies come from Klingenthal. Without a doubt, Mr. Ernst Uebel‘s composition called „Jubelklänge" is one of the most famous. Many bands play it over and over again. Music is also played in Klingenthal. 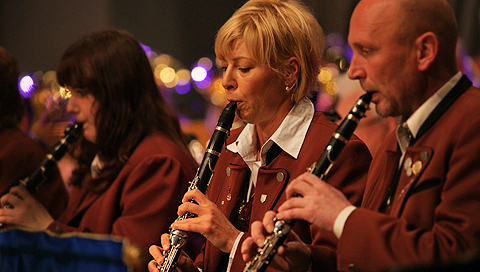 The city‘s three orchestras, the „Stadtorchester Klingenthal", the „Lindenkapelle" as well as the „Akkordeonorchester Klingenthal" perform in the pavilion next to the marketplace, especially during summertime. Even Klingenthal‘s innkeepers invite citizens and tourists to spend unforgettable evenings with music and fun. Due to the perfect acoustics in there, concerts in the church „Zum Friedefürsten" are a very special experience . In Klingenthal, musicians from allover the world meet. Every year in May, the International Competition of Accordions takes place in the city. In fall, players of diatonic accordions meet. During the 3rd weekend in September, a mouth organ-festival called „Mundharmonika live" takes place in Klingenthal. The museum of music and winter sports, the museum of mouth organs in Zwota and the factory of producing accordions show their exhibits and tell some interesting facts about the tradition of producing musical instruments.